Carol Mackenzie Gale B.A. (Hons) M.A. : Study of 'Blacks'. 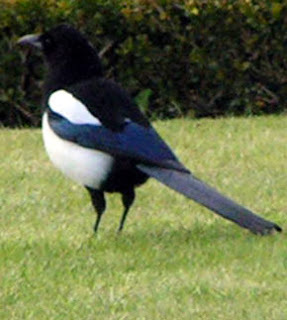 The Magpie is said to be black and white, but her 'black' feathers shine with blues and purples. 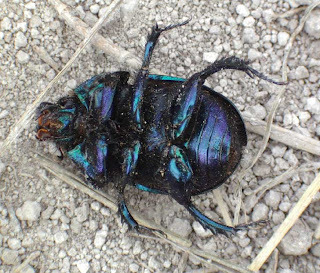 The 'black' Dor Beetle shines with iridescent turquoise and purples. 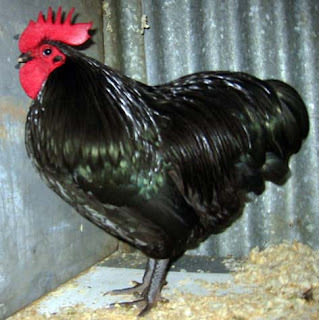 The Australorp chicken is said to be black but it's feathers gleam with greens and blues. The Corvus, (Crow, rook or raven), are black - or are they?. 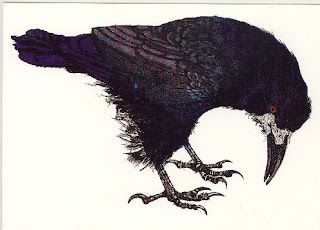 'Corvus' Etching by Julia Manning. COLOUR STUDY Terry Frost. 'Blacks'. Colour Analysis from Nature. Terry Frost. Scolar Press. “Being interested in abstraction, in Constructivism and in the experience of being around St. Ives, led me to deal with painting which was the result of walking, breathing the air and lying flat on our backs, ‘being intimate with the landscape’ ” – “in town the harbour, the streets the roof tops – geometrical division, space, movement and so on.” p.161. 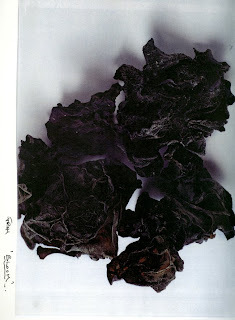 "Roger Hilton and I were struggling to flatten things out, to accept that we were working on a flat surface. We wanted just flat shapes and colour. If you keep a colour flat, then you’ve got to find a shape that will hold it flat, therefore you are involved with proportion and relationship to the next colour you put on”. Terry Frost. "There is no such colour as ‘black’ or ‘white’. Both are an amalgam or all colours, of light. There are matt blacks, glossy blacks, soft blacks, blue blacks, purple blacks, green blacks, maroon blacks. Each ‘black’ affects the colour juxtaposing it. Is a bright colour, say burnt orange, more powerful when placed in small splashes next to ‘black’ or a blue than when presented as a large area of colour on it’s own? This is one area I want to explore". I was also interested in his use of flat colour and abstract form. Terry Frost says, “ It is a question of reacting via the eyes through the heart and head for a full sensation. It is not a momentary sensation alone, for, from my experience; I see better the next time. It’s an additive experience; it’s a sort of cleansing process, so that each colour builds up more of its own spiritual value, its own being." “Just to think in terms of colour is enough to set the soul alight. This colour without shape – in the spirit. Shapes are known to people by words but colour can make its own shape and exist in its own right”. 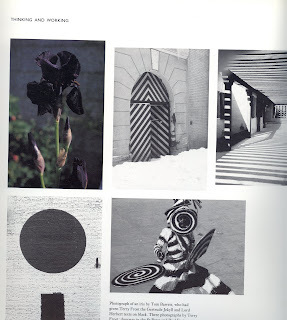 A page of Terry Frost's black studies. A beautiful 'black' flower - Bloom Magazine. Later he says: “I wouldn’t have painted the ‘Through Blacks’ or the ‘Through greys’ if I hadn’t insisted on the students finding out how many greys they could make or how many blacks, you see”. AF "But you never told the students that you can just chuck a bit of red in the black. They had to mix it all out of red, yellow and blue, but you can actually just use spectrum black and put some red in it, can’t you"? 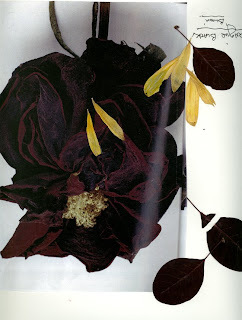 A 'black' rose. - Bloom magazine. I am quite excited about experimenting with creating 'blacks' from scratch on silk. How will they respond to a shiny crepe backed satin silk, or the matt finish of crepe de chine silk? Or even the translucence of crepe georgette silk? I was interested in a quote in Terry Frost's book, (above) from Gasch. You could say that the artists world is always an inner world, a world of deep cognitive discovery and imagination. So, is my way of working with ‘Zen’ meditation any different? I wonder if it is. Although working in meditation, the 'unconscious' feeds from something ‘conscious’ and thus becomes part of reality. I am planning to try to work from a deeper space within, working on larger pieces hanging vertically on the wall. I have been sampling my own 'blacks' by mixing equal proportions of various yellow, blues and reds. So far, the colours I have achieved have been gorgeous but rather pale. One black in particular, has worked well, a deep, warm 'midnight' black achieved by mixing yellow, red and navy. Tomorrow, I intend to sample further and show my results.